Our family programs can help. The alcoholic or addict is a heart-breaking puzzle for those who love them. Family members often know there’s a problem long before the addicted person does, but getting the addict to admit they have a problem with alcohol or drugs can be a maddening exercise in frustration. Loved ones are left feeling confused, anxious, desperate and alone. That’s why Renascent offers extensive family programs to help adults and children cope with the effects of addiction. Drug and alcohol addiction affects the entire family and the family system itself. Without knowing it, spouses, parents and children, as well as members of the extended family, can become lost in the downward spiral of addiction, just as the addict is. Getting a loved one to rehab is only one part of the puzzle, and sometimes he or she doesn’t want help. Renascent can still make a difference by helping the family work together to fight the effects of addiction. Addiction thrives when family members become isolated from one another, or disagree on recovery options. Family members need to know that addiction is recognized as a disease and that sustained recovery is possible. 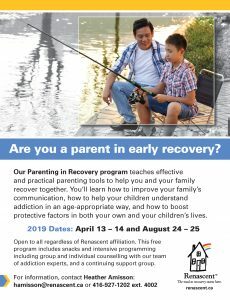 Renascent recognizes drug and alcohol addiction as a family disease and offers integrated treatment options for family clients aged 7 and up (with referrals for pregnant and younger children). At Renascent, children and family members are clients in their own right, not just accessories to someone else’s recovery. At Renascent we offer help to all those affected by someone’s addiction, whether or not the addict is willing to accept substance abuse treatment themselves. Our Family Care programs are specifically tailored to meet the distinct needs of individuals impacted by a family member’s drinking or drug use. Anyone who has been affected by another person’s drinking or drug problem is welcome to participate in Renascent Family Care. We also welcome Al-Anon members who seek additional support and education to strengthen their recovery. Learn how your loved one’s addiction has affected you, whether they are in active addiction or recovery, and acquire the tools to set boundaries and address enabling and codependent behaviours. Open to all regardless of Renascent affiliation. $320 includes group and individual counselling with our team of addiction experts, and continued aftercare. Sessions are available by phone so distance or shift work is never a barrier to your family’s recovery. Email Jennifer Bell or call 416-927-1202, ext. 4012 for more information. Let us help you break the cycle and change the legacy of addiction in your family. In this program, children ages 7-13 and their caregivers develop practical tools for self-care, and learn the skills to protect themselves from the effects of addiction. Open to all regardless of Renascent affiliation. 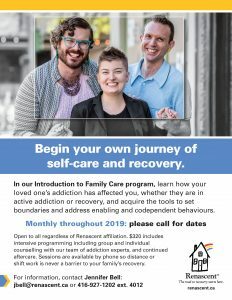 This free program includes meals, intensive programming including group and individual counselling with our team of addiction experts, and continued aftercare. Learn more about our Children’s Healthy Coping Skills program, and email Heather Amisson or call 416-927-1202, ext. 4002 for more information. Our Parenting in Recovery program teaches effective and practical parenting tools to help you and your family recover together. You’ll learn how to improve your family’s communication, how to help your children understand addiction in an age-appropriate way, and how to boost protective factors in both your own and your children’s lives. Open to all regardless of Renascent affiliation. 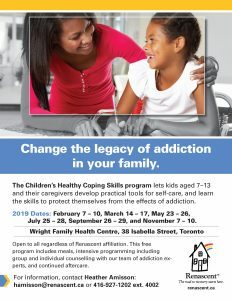 This free program includes group and individual counselling with our team of addiction experts, and continued aftercare. Email Heather Amisson or call 416-927-1202, ext. 4002 for more information. A weekly support group for alumni of Introduction to Family Care and the Intensive Family Codependency Retreat. Email Sunil Boodhai or call 416-927-1202, ext. 3010 for more information. A monthly gathering for alumni of Children’s Healthy Coping Skills, where children can reconnect with their counsellors and peers in recovery. Email Sunil Boodhai or call 416-927-1202, ext. 3010 for more information. Renascent offers one-on-one counselling to family members, children age 7 and up included. If you’re interested in personal counselling, we’re here to help. Email Sunil Boodhai or call 416-927-1202, ext. 3010 for more information. Free evening session for families to learn more about Renascent’s Family Care programs. Renascent supports ongoing family recovery by hosting weekly al-anon groups at our Toronto and Durham locations. Renascent is committed to allowing access to all programs regardless of financial position. We don’t receive any government support for our family programs so we’re entirely dependent on the generosity of our donors and the commitment of our clients to pay what they can – to keep the doors open for the next family in need. Give us a call toll-free at 1-866-232-1212 and talk to one of our family counselors. We’ll help you identify your family’s specific needs, tell you about our Family Programs in more detail, and discuss what options will work best for you and your family. All consultations are free and confidential.